Visitors to Minnesota often stop and wonder at the strange collection of ice fishing shacks that appear on the lakes each winter. Now even the locals are stopping to stare at a a group of shacks on Medicine Lake in Plymouth. The "Art Shanty Project" is a collection of ice houses with an artistic flair. Plymouth, Minn. — You can fish in Jonas Lindberg's ice shack, but it's really more of a place to sit and enjoy the view. It's a relatively straightforward affair, but he's made an effort to reflect the surrounding environment. It's got a white roof, pale blue transparent plastic walls, and simple wooden benches. The frozen lake serves as the floor - he's swept it clean so that you can peer down through the black ice several feet, watching cracks zigzag downward into darkness. He's got a hole drilled for fishing, and he plans to send a camera down with some light to shoot an underwater video. All in all, Lindberg seems pretty happy. "I paid 12 bucks to have a miniature cabin on the lake and you know most people have to work their whole life to afford house on the lake, so I think that's pretty nice," says Lindberg. A few yards away, Mike Hoyt is creating an ice painting. He paints figures onto sheets of translucent plastic, secures them in a box frame and covers them in lake water until they've frozen into large ice panels. Then he stands them up and the sunlight plays with the colors. "Mostly I've been working with just a series of people that have caught fish. Sort of like trophy fish, but removing the image of the fish and adding something else, another found object or image," says Hoyt. "I'm sort of playing with the idea of the magic and mystery of what you might pull out of the lake." In one picture a woman holds a frog with five legs; in another a man holds up a strand of pearls. Hoyt doesn't expect these to last. Within just a couple of days one painting was knocked over and broken into several pieces; others may melt on warmer days. Photographer Peter Haakon Thompson came up with the art shanty project - although he never meant for it to become such an event. He originally planned to just build his own shack and hang out with a couple of friends, taking a break from work. "I just really liked the idea of small spaces that you can fit everything into," says Thompson. "I'm a sailor and I really like sailboats and how everything fits into that small space." But once Thompson's friend David Pittman heard about the project, he immediately saw potential for something more. Now the Art Shanty project is in its second year, co-curated by Pittman and Thompson. Pittman has built a low-powered radio station in his shanty; another artist built a woodshop. One weekend Thompson's friend used his shack for a yoga class. "She decided that it would be wise to just do standing poses, which I think was a good idea," says Thompson. While Thompson's hut is only eight feet square, it was still able to fit 12 students. Thompson says building codes on frozen lakes are relatively lax, giving artists more freedom than they have on public land. But he has had one brush with the law; evidently if you're going to invite the public out onto the lake you need an event permit. "Two sheriffs deputies walked up and asked if they could see my event permit and I didn't have one and I didn't know anything about it," says Thompson. "I was envisioning that I'd be taken off the lakes in cuffs but that didn't happen. And I have to say they've been incredibly great about getting this all lined up." The art shanties are clustered together into their own makeshift community, but they are hundreds of yards away from a much larger village of more traditional ice houses. Thompson says they did this deliberately, because they didn't want to take up good fishing territory. Thompson says he'd like to know what the snowmobilers think of the art, but they tend to drive by at night, stopping briefly at each shanty before zooming off across the lake. "Part of the idea I think for us is that this is not an intimidating gallery environment," says Thompson. "So I think people are more willing to come and look at stuff if it just doesn't have that quiet gallery atmosphere. It's outside and there's kids and dogs running around and snowmobiles." 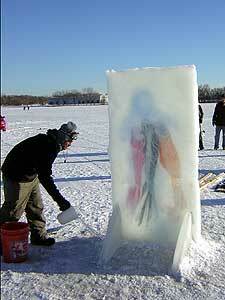 In addition, the Art Shanty Project has drawn some art lovers to get out of the city and out onto the ice. Lilian Rand convinced her husband Howard it was worth the trip, and so they spent an afternoon happily tramping from one ice house to the next, peering in. "It kind of amazed me," says Howard. "I grew up in Oshkosh Wisconsin near lake Winnebago and there was always this world but I never really cared much about it but now that I see the whole shanty town and so on, it's fascinating - it's almost like finding my roots again!" For those who can't bear the thought of walking on ice, or looking at art in the cold, there's hope. The Soap Factory in Minneapolis will remount the Art Shanty project next summer in its gallery.